Taken from her forthcoming EP which will feature some of the best new emerging artists from the fast-growing wave of Afrobeats music in Nigeria, super entertainer JBabie is proud to unveil her 1st brand new single for 2018 titled Do Me Jeje featuring the SoundJigga K-Solo. 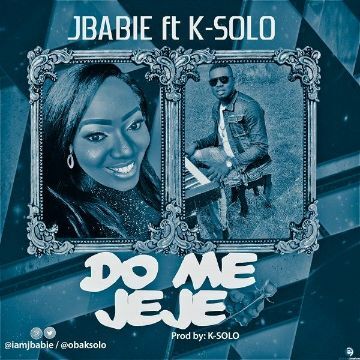 Better known from her huge underground hit Wantintin featuring K-Solo four years ago in the UK, she has linked up again with buzzing producer K-Solo for this smooth Afro-R&B-esque offering, which sees JBabie and K-Solo waxing lyrically on Do Me Jeje. Backed by excellent live instrumentation, including a catchy sub bassline, melodic synth chords and lush percussions, nice crafted by K-Solo, Do Me Jeje is an infectious tune from start to finish, held together nicely by JBabie’s infectious vocal delivery, assured flow, and a memorable chorus that will leave you singing along after one listen.